The NX200 could be perceived as a slightly confusing object – unlike almost every other manufacturer, Samsung have not offered basic modes for beginners and advanced modes for more experienced photographers. Instead, they have gone with one approach applied across all modes. Dubbed “Smart Panel” it provides quick and simple access to all the shooting settings that you’ll want to use regularly. The sensor resolution is high too – at 20.3megapixels, it rivals many DSLR cameras in terms of pixel count. And Samsung have given it the ability to shoot at 7fps. Again, this is better than most DSLR cameras can achieve. The 3inch AMOLED display is another highlight that makes viewing the screen easier in bright sunlight – an important consideration for hybrid cameras that don’t feature a traditional viewfinder. An ISO range that extends to 12,800 puts the NX200 to the top of the class in terms of specification. But with such a high resolution for an APS-C sensor, let’s see how it fared in the lab tests. In terms of overall performance, the NX200 does very well with a DxOMark overall score of 69 – enough to put the sensor 60th in the DxOMark sensor rankings. This is just above the Sony NEX5, one place behind the Nikon D300s and only four places behind the Canon EOS 5D. While these two DSLR models are a little older now, it shows how well the hybrid camera sensors are performing relative to two DSLR models that just a couple of years ago were considered industry heavyweights. Looking a the scores in more detail, we can see that the Portrait score of 22.6bits is good enough to put the NX 200 into 69th in the portrait score rankings. Even more impressive is the Landscape score that measures dynamic range – 12.6 Evs puts the camera into 33rd place. If we stopped here, it would seem that the NX 200 was a highly capable camera in all situations. However, the Sports score – that measures low-light ISO performance – is the Achilles heel of the NX 200. A score of 618 ISO puts the camera into 92nd place on the overall ISO rankings. For an APS-C sensor, this is lower than expected and compared to other APS-C sensor hybrids, and it’s near the bottom of the pile. By comparison, the top performing (in the ISO tests) APS-C sensor hybrid, the Pentax K 01, scores 1135 ISO – a significant difference. In the large sensor hybrid market place, the Sony NEX-6 is one of the best performing cameras currently available, coming in at 32nd place on the overall scores. It represents a benchmark for other hybrids to compare themselves to. Looking at the Portrait scores, the NEX-6 certainly comes out on top (23.7bits vs 22.6bits), scoring around 2/3rds if a stop better. It is closer in the Landscape tests, but there is still a difference of around 1/2stop in favour of the NEX-6 – this is throughout the ISO range until the very highest ISO setting on the NX 200 (ISO 12800) where image smoothing is applied and the dynamic range is much closer. The biggest difference here is visible at ISO 3200, where there is more than 1-stop difference in the results. The ISO range is equally interesting – from ISO 100 to 3200, the NEX-6 is again around 2/3rds stop better than the NX 200. However, from ISO 6400 to 12800, the NX 200 catches up due to in-camera processing of the RAW files to remove image noise. At these two high ISO settings, the NX 200 actually outperforms the NEX-6, though the differences are marginal. The color sensitivity of the Samsung NX 200 falls behind the Sony NEX-6 at all ISO settings until ISO 6400 where there is a jump in performance. This clearly indicates some form of in-camera processing to smooth the image and improve results. While Sony are firmly established in the hybrid market, the Canon EOS M is a relative newcomer. Overall, the NX 200 outscores the EOS M by 69 to 65 DxOMark points. This is due to the 1/3rd stop better performance in the Portrait tests and around 1-stop better performance in the Landscape tests at ISO 100, although the EOS M does claw its way back beyond ISO 800. However, while the EOS M is not one of the top performers in the category in terms of ISO performance, it still outperforms the NX 200 by around 1/3rd stop. Given the larger sensor size in the NX 200, this is a surprise and shows quite how much of a weakness this is for the camera. Looking at some of the other big players in this sector shows the same story as before. In overall score, the NX 200 is just a fraction behind the Panasonic Lumix DMC-GH3, but is a fair way ahead of the Nikon 1 V1. In terms of color depth (portrait) scores, there is barely anything between the GH3 and the NX 200, while the Nikon 1 V1 is around a stop behind. It’s the same with the landscape scores for dynamic range – the NX 200 and GH3 are very closely matched, with the NX 200 just coming out on top here. Again, the Nikon 1 V1 is a little over 1 stop behind. It is, once again, the ISO scores where the NX 200 falls down. If it had better ISO performance, it would rival the top performers in the category, but only managing 618 ISO in the sports test sees it fall behind the GH3 by over 1/3rd stop. That said, compared to the Nikon 1 V1, at ISO 100, the Samsung score is 1.5stops ahead of the Nikon. 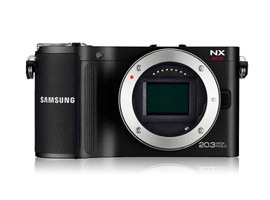 The Samsung NX 200 is in many ways a very capable camera. If you are not worried about shooting in low light, then the color depth and dynamic range will see it produce very high quality images whether you’re shooting portraits or landscapes. It’s only when the light levels fall that you’ll start to see the problems of ISO performance appear. As is often the case in this market segment, it’s not always about the fine detail of camera image performance. So the inclusion of full HD video at 30p and the ability to shoot stills at 7 frames per second may well move the NX 200 to the top of the list. Samsung are also taking strides to provide a range of lenses to suit too. With 5 lenses in the current range, including two pancake models, there are several options available to you. Equally, for many the look of the camera can be just as important. Here, the NX 200 scores well – the metal body looks handsome and purposeful and provides a premium feel. Overall, it may not be the best hybrid camera available, but if you can look past its poor ISO performance, you’ll find a willing photographic companion.